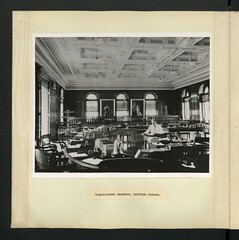 Description: Legislative Chamber, British Guiana. This video shows how to search two engineering and science literature databases: Compendex and Inspec. Compendex covers literature in all aspects of engineering, while Inspec focuses on electronics, computing, control, robotics, and physics literature. Both databases go back to the 1880s! If you have questions or comments about the MIT Libraries, Ask Us! This Week on VUCast, Vanderbilt’s online newscast: Moving on Up! Carry some boxes with the class of 2016! Big Dig! A special look at the latest building progress Why is Vanderbilt so happy? Meet some NYIT Alum, see where they are working and how Career Services helped get them there. Windows 8 contracts are agreements between Windows 8 and your app that allow you to integrate your app into Windows 8 experiences. For example, Windows 8 lets users share content from one app to another by using the Share contract. In this session, you'll learn how contracts work and how to implement the built-in contracts such as Search, Share, Settings and Play To. Expedition 32 Flight Engineers Joe Acaba and Suni Williams aboard the International Space Station answer questions from NASA social media followers.